Background: One in three women around the world are or have been subjected to violence. This includes in Australia, where violence against women is an urgent public health and human rights issue. Immigrant and refugee women who have resettled in Australia are known to face barriers accessing services aimed at preventing and responding to family violence. However there is little evidence about the contexts, nature and dynamics of violence against immigrant and refugee women to inform appropriate responses to enhance their safety and well-being. 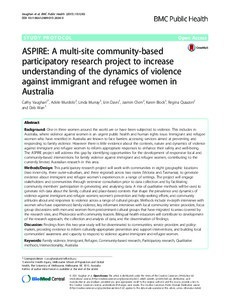 The ASPIRE project will address this gap by identifying opportunities for the development of responsive local and community-based interventions for family violence against immigrant and refugee women, contributing to the currently limited Australian research in this area. Methods/Design: This participatory research project will work with communities in eight geographic locations (two inner-city, three outer-suburban, and three regional) across two states (Victoria and Tasmania), to generate evidence about immigrant and refugee women’s experiences in a range of settings. The project will engage stakeholders and communities through extensive consultation prior to data collection and by facilitating community members’ participation in generating and analysing data. A mix of qualitative methods will be used to generate rich data about the family, cultural and place-based contexts that shape the prevalence and dynamics of violence against immigrant and refugee women; women’s prevention and help-seeking efforts; and community attitudes about and responses to violence across a range of cultural groups. Methods include in-depth interviews with women who have experienced family violence, key informant interviews with local community service providers, focus group discussions with men and women from predominant cultural groups that have migrated to areas covered by the research sites, and Photovoice with community leaders. Bilingual health educators will contribute to development of the research approach, the collection and analysis of data, and the dissemination of findings. Discussion: Findings from this two-year study will be disseminated to communities, service providers and policy-makers, providing evidence to inform culturally-appropriate prevention and support interventions, and building local communities’ awareness and capacity to respond to violence against immigrant and refugee women.